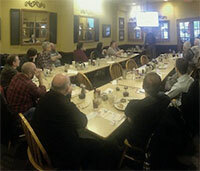 Welcome to the FileMaker Pro Users Group Dallas Chapter. We are a computer users group that supports software users and developers of FileMaker's Workplace Innovation Platform software. The meeting location is near to Arapaho Road and the Dallas North Toll Road in the North Dallas area. Our meetings start at 11:00am and go until around 12:30pm. We meet in the private meeting room. The meetings are free, but the food costs if you order. Most of our meetings are about a presentation on a specific FileMaker software topic, often with a lot of community interaction and feedback. Everyone is welcome to the user group meetings and there is no requirement for attendance other than decent civility (e.g., Golden Rule). The topics we present tend to be intermediate to advanced development topics. Typical topics are about calculations, schema, user interace, scripting, security and plugins. The meetings are small enough for good audience interaction typically with 10-25 people in attendance. All of our schedules and contact information is, appropriately, in a FileMaker database. You will need FileMaker Pro software to access it. Click the link for the database up in the banner bar to enter! We are an unaffiliated independent organization organized to further software educational purposes using FileMaker platform. While we promote and teach FileMaker software, we are not legally connected with or otherwise related to FileMaker, Inc. (FMI). We are recognized by FileMaker, Inc., as a Users Group, and that is the extent of our relationship. We used to operate our web page under the umbrella of www.FMPUG.com, the FileMaker Users Group national organization, and still maintain some of our information there. If you are interested in being a corporate sponsor, please contact us through our database link. Connect through our FileMaker database to contact us.